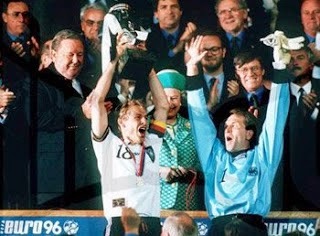 On 30 June 1996, Germany won the UEFA Euro Final with a golden goal in the 95th minute, defeating the Czech Republic 2-1 before a crowd of 73,611 at London's Wembley Stadium. The teams met earlier in the tournament during the group stage. Germany won by the comfortable margin of 2-0, with both goals coming in the first half. The goals did not come so quickly for Germany in the Final, as the first half ended scoreless. 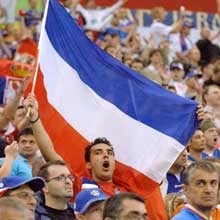 The Czechs went ahead 1-0 in the second half when midfielder Patrik Berger converted a penalty kick in the 59th minute. In the 69th minute, with the Czech Republic still ahead, German manager Berti Vogts replaced midfielder Mehmet Scholl with forward Oliver Bierhoff. The substitution worked, as Bierhoff equalized for Germany with his first goal of the tournament four minutes later, and regulation time ended with the match tied 1-1. The 1996 tournament was the first European championship to apply the Golden Goal rule, which meant that the game ended upon the scoring of a goal in extra time. If, after two periods of extra time, no goal were scored, the match would be decided by penalty kicks. As it turned out, however, no penalty kicks were needed. Bierhoff scored his second goal of the match (and the tournament) in the 95th minute, giving Germany the 2-1 win and the 1996 UEFA Euro title. It was the first major tournament to be decided by a golden goal. 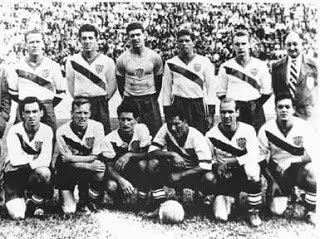 On 29 June 1950, the United States pulled off one of the most improbable upsets in football, defeating England 1-0 in a World Cup group stage match before a crowd of over 10,000 at the Estádio Raimundo Sampaio in Belo Horizonte, Brazil. England had dominated international football after World War II, winning 23 matches, drawing three and losing only four. They also had forward Stanley Matthews, considered by many to be the best footballer of the era. The 1950 tournament was England's first World Cup, as they had not entered the previous tournaments, and expectations were high. Oddsmakers pegged England as 3-1 favorites to win the title. The United States, by contrast, had lost their last seven matches (a series stretching back to the 1934 World Cup) by the combined score of 45-2, including a 3-1 loss to Spain four days prior. Eight of the US starting 11 were US-born citizens, while the other three - forward Joe Gaetjens, defender Joe Maca, and the US captain, midfielder Ed McIlvenny - were citizens of Haiti, Belgium, and Scotland, respectively, who qualified under the rules at the time by declaring their intent to apply for US citizenship (though, of the three, only Maca eventually became a US citizen). Matthews had missed England's first match, a 2-0 win against Chile, and was left on the bench against the US, as England's selection committee, over the manager's objection, opted not to change a winning side. The decision was heavily scrutinized after the match; however, even without Matthews, England appeared to be in control, dominating possession and taking 20 shots to the US's one. It was the one that mattered, though. In the 38th minute, American defender Walter Bahr sent a high, arcing ball into the England penalty area. As English keeper Bert Williams rushed to collect it, Gaetjens ducked, sending the ball off the back of his head and into the net. England applied frantic pressure in an attempt to equalize, but were denied by a combination of the woodwork and the sensational play of American keeper Frank Borghi. Although the US were eliminated from the tournament after their next match, a 5-2 loss to Chile, and did not qualify for another World Cup until 1990, the 1-0 victory over England is considered a pivotal moment for the US national team. On 28 June 2006, the Football Association of Serbia and Montenegro (the FSSCG) split into two separate associations: the Football Association of Serbia (the FSS) and the Football Association of Montenegro (the the FSCG). The split eliminated the last football remnants of a unified Yugoslavia, as all of its former republics now had their own associations. The Yugoslavian national football team had existed in various forms since 1920, when it represented the Kingdom of Yugoslavia. Its most successful squad during that period was the 1930 team, which reached the World Cup semifinals. After a hiatus from 1941 to 1945 due to World War II, the team re-emerged under the banner of the Socialist Federal Republic of Yugoslavia. They enjoyed a strong period in the 1960s, finishing in fourth place at the 1962 World Cup and reaching the Final in both the 1960 and 1968 UEFA European Championships. At that time, Yugoslavia comprised six regional republics - Slovenia, Croatia, Bosnia and Herzegovina, Macedonia, Montenegro, and Serbia - as well as two autonomous provinces - Kosovo and Vojvodina. In 1991, Slovenia and Croatia declared their independence, triggering the dissolution of the Socialist Federal Republic. In 1992, Serbia and Montenegro established the Federal Republic of Yugoslavia. Despite finishing at the top of their qualifying group for the 1992 UEFA European Championship, the Federal Republic was banned from participating in the tournament due to the ongoing civil wars among the former Yugoslav states. FIFA also banned it from participating in the 1994 World Cup. In 2003, the Federal Republic officially dropped the name "Yugoslavia" and changed its name to Serbia and Montenegro for both the state and the national team. Montenegro then declared its independence from Serbia in 2006, resulting in the split between the two football associations and ending the last political union between former Yugoslav republics. FIFA recognizes the Serbian side as the successor to Yugoslavia. On 27 June 2006, Brazilian striker Ronaldo Luís Nazário de Lima scored in a World Cup match against Ghana. It was Ronaldo's 15th World Cup goal, breaking the previous record of 14 which had been set in 1974 by West German striker Gerhard "Gerd" Müller. Ronaldo had already netted twice in the group stages of the tournament and was widely tipped to score the record-breaking goal in the Round of 16 against Ghana. Few predicted the speed with which he would score it, however. In the 5th minute, Brazilian midfielder/forward Ricardo Izecson dos Santos Leite ("Kaká") threaded a pass through to Ronaldo, leaving him one-on-one against the Ghanian keeper. Ronaldo sent the keeper the wrong way, slipped past him and prodded the ball into the empty net. The goal also set another record - with his third of the tournament, Ronaldo joined German striker Jürgen Klinsmann as the only two people to score at least three goals in three separate World Cups. Brazil went on to defeat Ghana 3-0, but lost to France 0-1 in the quarterfinals. 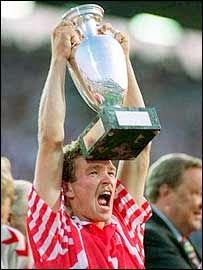 26 June 1992 - Is There A Danish Word For "Cinderella"? On 26 June 1992, Denmark won the UEFA European Championship, defeating Germany 2-0 before a crowd of 37,800 at Ullevi Stadium in Gothenburg, Sweden. The Danes were unlikely champions, having initially failed to qualify for the tournament. They finished second in their qualifying group, losing out to Yugoslavia by a single point. On 30 May 1992, however, just eleven days before the opening day of the tournament, the United Nations issued a trade embargo against Yugoslavia in response to that country's ongoing ethnic conflicts. Yugoslavia was thus disqualified from participating and Denmark was called in as a replacement. As to be expected from a team that had not been planning to play in the tournament, the Danish side got off to a shaky start, drawing with England (0-0) and losing to hosts Sweden (1-0), before finally securing a win against France (2-1) in its last group stage match. The win placed Denmark second in its group, just one point of ahead of both France and England, and sent the Danes through to the knockout rounds. In its first knockout match, Denmark faced the Netherlands, who were the defending Euro title holders. After trading goals to finish 2-2 at the end of extra time, Denmark won on penalties, 5-4, to advance to the Final against defending World Cup champions Germany. In the Final, Danish midfielder John Jensen (pictured) opened the scoring in the 18th minute. Describing his goal after the match, Jensen told the press: "The first 20 minutes of football were the hardest most of us had ever faced. The Germans were all over the pitch and we couldn't get into our play. We were working tirelessly and suddenly I had the chance to have a shot at goal. I remember the manager had said to me before the game that if I have a chance to take a shot, then I should go for it." The Danes kept Germany from scoring and, in the 78th minute, Jensen's midfield partner Kim Vilfort added a second goal as unnecessary insurance. The match ended at 2-0, giving the Danes their first major trophy. On 25 June 1990, the Republic of Ireland, competing in its first ever World Cup, defeated Romania 5-4 on penalties before a crowd of 31,818 at Genoa's Stadio Luigi Ferraris. The win sent Ireland through to the quarterfinals, which is the farthest the Republic has ever advanced in World Cup competition. The Irish seemed intent on drawing the match with Romania as well. While the Romanians played with flair and style, the Irish matched them with grit and determination. Neither side was able to score through 90 minutes of regulation and 30 minutes of overtime, so the match went to penalty kicks. Even then, there was little to separate the sides, as the first four kickers from each team successfully converted. That changed, however, when Romanian forward Daniel Timofte stepped up to take his side's fifth kick. Timofte, who had come on as a substitute in the 96th minute, sent his shot to the left, where Irish keeper Pat "Packie" Bonner (pictured) dove to meet it and swatted it away. Forward David O'Leary, who had come on in the 95th minute, then put his shot past Romanian keeper and captain, Silviu Lung, giving Ireland the victory. After the match, the Irish team's English manager, Jack Charlton, told the press: ''The pubs will sell more booze tonight than they have in the last year. There's going to be a party this town has never seen the likes of before, a party Dublin has never seen the likes of before." Although Ireland lost in the quarterfinals to Italy, the shootout with Romania has become famous and was later immortalized in the film version of Roddy Doyle's The Van. On 24 June 2007, the United States successfully defended their 2006 CONCACAF Gold Cup title, defeating Mexico in the 2007 Final before a crowd of 60,000 at Chicago's Soldier Field. The 2007 tournament was the ninth Gold Cup competition, which includes teams from the CONCACAF regions of North America, Central America, and the Caribbean. The North American teams dominated the group stage, with only two losses among them. Both the United States and Canada finished at the top of their groups, with Mexico finishing second to Honduras in its group on goal differential. In the knockout stages, the United States advanced to the Final with victories over Panama (2-1) and Canada (2-1), while Mexico secured its spot with wins over Costa Rica (1-0, a.e.t.) and Guadeloupe (1-0). Both sides played aggressively, with El Tri dictating a fast pace. The United States struggled defensively in the first half and paid the price in the 44th minute as Nery Castillo placed a perfect cross for Andrés Guardado, who slammed the ball into the roof of the net. The US came out after the break with even more energy. They equalized in the 66th minute, as forward Brian Ching was pulled down in the box by Jonny Magallón and US captain Landon Donovan drilled the ensuing spot kick home. Mexican keeper Oswaldo Sanchez played well, but was eventually beaten in the 73rd minute by a thunderous game-winning volley from US midfielder Benny Feilhaber. It was the United States' fourth Gold Cup trophy, which tied them with Mexico for total Gold Cup titles. As winners, the US earned a spot in the 2009 Confederations Cup in South Africa. On 23 June 1972, French star midfielder Zinedine Zidane was born in Marseille. His parents were Kabyle Muslims from the village of Aguemone in Algeria. They moved to Paris in 1953 and settled in Marseille a few years later. Zidane, nicknamed "Zizzou," started his professional career with Cannes, where he played from 1988 to 1992. He transferred to Bordeaux for the 1992-93 season and helped them to win the Intertoto Cup in 1995. In all, he made 174 appearances for the Girondins, scoring 37 goals. He also earned individual recognition, being named the Ligue 1 Best Young Player in 1994 and Best Player in 1996. In 1996, he moved to Juventus and helped them claim back-to-back Scudettos in his first two seasons. They also made consecutive appearances in the UEFA Champions League Finals those years, but lost to Borussia Dortmund in 1996 and Real Madrid in 1997. In 1998, he won the Ballon d'Or, due in part to his role in leading France to the 1998 World Cup title. He also won the 1998 FIFA World Player of the Year award, which he won again 2000. In 2001, Zidane moved again, this time to Real Madrid for what was then the world record transfer fee of €76 million. He culminated his first season in Madrid by scoring the winning goal in Real's 2-1 win over Bayer Leverkusen in the 2002 UEFA Champions League Final. In 2003, he again won the FIFA World Player of the Year award, becoming only the second person to claim the honor three times (along with his Real teammate Ronaldo). Despite all of his success on the pitch, he is probably best remembered for the 2006 World Cup in which he was sent off for head-butting Italy's Marco Materazzi in the 110th minute of the Final. It was his last professional match, as he retired from football after the tournament. On 22 June 1986, Argentina defeated England 2-1 in a World Cup quarterfinal match before a crowd of 114,580 at Mexico City's Estadio Azteca. The Falklands War between the two countries had ended just over four years prior, which added to an already intense rivalry between the national sides and raised the emotional stakes of the match. The Argentinians, managed by Carlos Bilardo, had the better of the first half, with most of the opportunities created by midfielder Diego Maradona. England keeper Peter Shilton held firm, however, and the teams reached halftime with a scoreless draw. Six minutes after the break, English left midfielder Steve Hodge bobbled a clearance attempt, sending the ball into his own penalty area. Both Shilton and Maradona raced to meet it, with Shilton having an apparent advantage due to his 6' 1" (1.85 m) height, as compared to the 5' 5" (1.65 m) Maradona. Maradona got to the ball first, however, and punched it into the goal with his left hand. 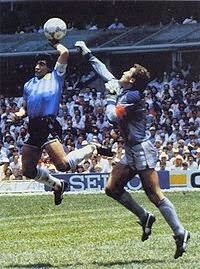 The referee, believing that Maradona had headed the ball into the net, allowed the goal to stand. After the match, Maradona told reporters that the goal was scored "un poco con la cabeza de Maradona y otro poco con la mano de Dios" (a little with the head of Maradona and a little with the hand of God). The goal thus became famous as the "Hand of God" goal. Just four minutes later, Maradona scored an even more famous goal. He received the ball just inside his own half and proceeded to dribble through the English side, getting the shot off right before being tackled. The display of individual skill earned the title of "Goal of the Century" in a FIFA poll prior to the 2002 World Cup. England striker Gary Lineker scored in the 80th minute, but Barry Robson's side was unable to produce an equalizer and Argentina won, 2-1. The Argentinians went on to win the tournament with a 3-2 victory of West Germany in the Final. On 21 June 1955, renowned French midfielder Michel Platini was born in the tiny commune of Jœuf in northeastern France. The three-time European Footballer of the Year and former captain of the French national team once told a reporter "I was born in football. My father was a very good football player, and as an Italian immigrant was always passionate about the game. Football is a fantastic and intelligent game which teaches us how to live together, how to share when you are better than others. Football is an extraordinary education for life." He played his youth football with his hometown side, A.S. Jœuf, from 1966 to 1972, when he signed a senior contract with nearby A.S. Nancy. He won the first major trophy of his career with Nancy, defeating Nice in the 1978 Coupe de France Final. He also started to earn individual recognition, being named France Football Magazine's French Football Player of the Year in 1976 and 1977. He played for Nancy until 1979, then moved to Saint-Étienne, where he helped win the Ligue 1 title in 1981. In 1982, Platini transferred to Juventus, where he would become one of the world's most distinguished footballers. When being introduced in Turin, the rarely-humble Platini told the crowd "I began by playing for the biggest club in the Lorraine region, went on to the biggest club in France and ended up with the biggest in the world." During his time with Juventus, he earned a string of individual and club honors, including two Serie A titles (1984, 1986), the European Cup Winners Cup (1984), and the European Cup (1985). He also led France to the 1984 European Championship trophy. Individually, he was named European Footballer of the Year in 1983, 1984, and 1985. Platini retired from playing in 1987 and spent four years as manager of the French national team from 1988-92. He is currently president of UEFA. 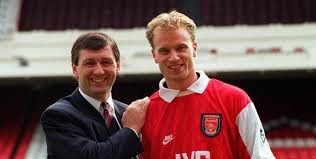 On 20 June 1995, Arsenal signed Dutch striker Dennis Bergkamp from Inter for a fee of £7.5 million. Nicknamed "the Non-Flying Dutchman" due to his fear of flying, Bergkamp was a product of the Ajax youth academy and played for the Amsterdam senior side from 1986 to 1993, helping them to the Eredivisie title (1989-90), the KNVB Cup (1987, 1993), the European Cup Winners Cup (1987), and the UEFA Cup (1992). In total, he scored 122 goals in 239 matches for Ajax and was voted Eredivisie Player of the Year in 1992 and 1993. In 1993, he was signed by Inter for £12 million. He helped them win the UEFA Cup in 1994, but never settled in with the team or the Italian style of play. Over his two seasons in Milan, he scored only 10 goals in 50 appearances before being being signed by Arsenal manager Bruce Rioch in the summer of 1995. Inter president Massimo Moratti, unhappy with the £4.5 million loss, reportedly claimed "They will be lucky if he scores 10 goals this season." And indeed Bergkamp's Arsenal career started slowly. He made his debut on 19 August 1995 against Middlesbrough, but did not score until his seventh match. He finished the season with 16 goals in 43 appearances. His Arsenal career truly began to flourish, however, with the arrival of manager Arsène Wenger in September 1996 and he was a key member of the Invincibles, Arsenal's unbeaten league side of 2003-04. In all, Bergkamp made 411 appearances for the Gunners, scoring 120 goals. With Bergkamp, Arsenal won three Premier League titles (1998, 2002, 2004) and four FA Cup trophies (1998, 2002, 2003, 2005). He retired from playing after the 2005-06 season. On 19 June 1958, Brazil defeated Wales 1-0 in a World Cup quarterfinal match before a crowd of 25,000 at Råsunda Stadium in Stockholm, Sweden. The Brazilian team was eager to prove itself after an early exit in the previous World Cup. Several new players had been added, as well as a new manager, Vicente Feola. They had finished at the top of their group in the first round without conceding a goal, including wins over Austria (3-0) and the Soviet Union (2-0), and a 0-0 draw with England. The Welsh side, on the other hand, had advanced to the quarterfinals without a win. 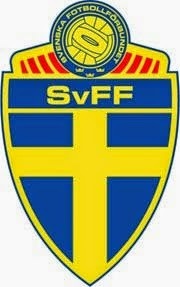 They drew with Hungary (1-1), Mexico (1-1), and Sweden (0-0) to finish second in their group. In the first half, both sides played defensively and neither was able to score. That changed in the 66th minute. Brazil's central midfielder Didi headed the ball into the Welsh penalty area, where it was collected by the youngest player in the tournament--Edison Arantes do Nascimento, nicknamed Pelé, a 17-year, 239-day old Brazilian midfielder who was playing in only his second World Cup match. 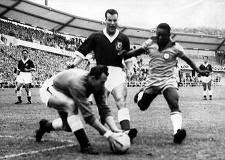 Pelé chested the ball down and deftly passed it around the Welsh defender before slotting it into the bottom corner of the goal. It was his first World Cup goal and the only goal of the match, giving Brazil the win. Brazil advanced and eventually won the tournament, beating Sweden 5-2 in the Final. Pelé scored five more goals in the tournament, including two in the Final against Sweden. He went on to become the all-time leading scorer for the Brazilian national team with 77 goals in 92 appearances and led them to two more World Cup titles in 1962 and 1970. On 18 June 2002, World Cup co-hosts South Korea upset Italy 2-1 in a Round of 16 match before a crowd of 38,588 at South Korea's Daejeon World Cup Stadium. With three minutes of regulation time remaining, Italy looked certain to advance, holding a 1-0 lead earned with an 18th minute goal from veteran striker Christian Vieri. In the 88th minute, however, Italian defender Christian Panucci mishandled a pass, opening the door for Korean winger Seol Ki-Hyeon, who scored the equalizer. The late goal shocked the Azzurri and sent the match to extra time. The situation worsened for Italy in the first period of added time, as midfielder Francesco Totti received a second yellow card for an apparent dive and was sent off in the 105th minute. As the match entered the final minutes of extra time and appeared to be headed for penalties, Korean midfielder Ahn Jung-Hwan scored a header in the 117th minute to give the Korean side the victory. The goal was redemptive for Ahn, whose penalty kick in the 5th minute was saved by Italian keeper Gianluigi Buffon. Ahn was also the only member of the Korean side to play his club football in Italy, at the time on loan with AC Perugia. The day after the match, Perugia canceled Ahn's contract, with Perugia owner Luciano Gaucci reportedly saying "I have no intention of paying a salary to someone who has ruined Italian football." The club quickly apologized and offered to purchase Ahn's contract, but he declined and moved to Japanese side Shimizu S-Pulse. South Korea followed their epic win with an equally-historic victory over Spain on penalties. They then lost to Germany, but finished the tournament in fourth place. On 17 June 2003, Manchester United sold their star midfielder David Beckham to Spanish giants Real Madrid. Beckham signed with Manchester United in 1991 at the age of 14 and helped secure a number of honors for the Old Trafford club, including six Premier League titles, two FA Cup trophies, and one UEFA Champions League trophy. He also earned numerous individual awards, including the PFA Young Player of the Year (1996-97), the UEFA Club Player of the Year (1999), and the BBC Sports Personality of the Year (2001). In all, Beckham made 394 appearances for the Red Devils in all competitions, scoring 85 goals. By the year 2000, despite his success on the pitch, his relationship with manager Sir Alex Ferguson began to deteriorate, due in part to Beckham's off-pitch commitments and growing celebrity following his marriage to Victoria "Posh Spice" Adams in 1999. The relationship between player and manager hit bottom on 15 February 2003 when, after an FA Cup loss to Arsenal, Ferguson kicked a boot that hit Beckham above the eye, requiring stitches. At the end of that season, with the relationship beyond salvage, Manchester United sold Beckham to Real Madrid for €35 million (£25M) on 17 June. 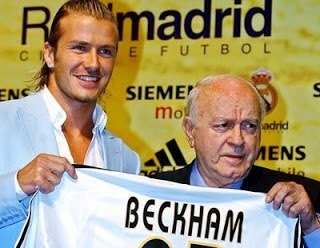 The transfer was completed on 1 July 2003, making Beckham only the third Englishman to play for the Spanish side. After spending twelve years with United, the move triggered a peripatetic period in Beckham's career. He spent only four seasons with Real, helping them to the La Liga title in 2006-07. In the summer of 2007, he moved to the United States, joining MLS side L.A. Galaxy. He remained there until 2012, including two loan spells with AC Milan, then finished his career at Paris St. Germain. Labels: AC Milan, Alex Ferguson, David Beckham, Los Angeles Galaxy, Manchester United F.C., Paris Saint-Germain F.C., Real Madrid C.F. On 15 June 1924, Sweden came from behind to win the inaugural match of the Nordic Football Championship, defeating Denmark 3-2 at the Idrætsparken in Copenhagen before a crowd of 25,000. That first tournament was played over the course of five years, with each of the three participating countries—Sweden, Denmark, and Norway—playing each other team twice each year. Finland joined in 1929 at the start of the second tournament and both Iceland and the Faroe Islands joined in 2000. In that opening match, Denmark took a 2-0 lead early in the second half with goals from Alf Olsen (2') and Ernst Nilsson (47'), before Sweden surged back. Striker Per Kaufeldt started the rally with a goal in the 56th minute and then 19-year-old Sven Rydell equalized in the 65th minute. Rydell completed his brace with the game winner in the 74th minute. When the tournament ended in 1928, Rydell was the leading goal scorer with 15 (12 of which came in matches against Norway, including two hat-tricks and one match in which he scored four). Denmark claimed the first title, however, finishing with 7 wins, 2 draws, and only 1 loss to top the table with 16 points, three more than second-place finisher Sweden. Norway was last with a single point. 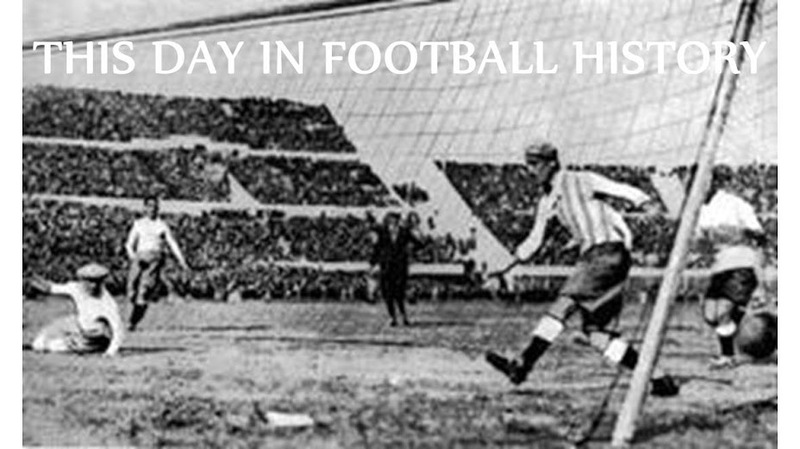 On 14 June 1925, Barcelona played a match that was almost its last. Barça had organized the 14 June match against Jupiter, another Barcelona club, in honor of the Orfeó Català, an amateur choir founded in 1891. The Orfeó Català, also based in Barcelona, was a touchstone of Catalan culture. At that time, however, Spain was controlled by dictator Miguel Primo de Rivera v Orbaneja, whose government was openly hostile to Catalonia and had even banned the Catalan language. A British Navy ship was docked in the Barcelona harbor and Barça's manager, Englishman Ralph Kirby, invited the ship's band to play at the match. The band played the Spanish national anthem, which the crowd booed, and then the English anthem "God Save the King," which the crowd applauded. The government responded by fining the club, forcing the resignation of club president Joan Gamper, and shutting the team down for six months. Unable to play, Barça nearly went bankrupt, but was saved by donations from loyal supporters and a local bank. On 13 June 1956, Real Madrid defeated Stade de Reims 4-3 in the very first European Cup Final, held at the Parc de Princes in Paris before a crowd of 38,239. The tournament was conceived by Gabriel Hanot, a French sports journalist and editor of L'Équipe, who was motivated by the British press declaring Wolverhampton Wanderers "Champions of the World" after the club's string of successful European friendlies. Real advanced to the Final with wins over Swiss side Servette (7-0 agg. ), Yugoslavian team Partizan (4-3 agg. ), and AC Milan (5-4 agg.). Reims secured their place in the Final by defeating Denmark's AGF Aarhus (4-2 agg. ), Hungary's Vörös Lobogó, and Scotland's Hibernian, the only British team in the tournament (3-0 agg.). In the Final, Reims took an shocking early lead with a 6th minute goal from defender Michel Leblond and another in the 10th minute from forward Jean Templin. Real equalized before the break with goals from midfielder Alfredo Di Stéfano (14') and forward Héctor Rial (30'). In the second half, Reims again took the lead with a goal from midfielder Michel Hidalgo (62'), but the Spanish side proved stronger down the stretch, getting an equalizer from defender Marquitos (67') before Rial scored the match winner in the 79th minute. It was the first of five consecutive European Cup titles for Real, who now hold a record ten titles. 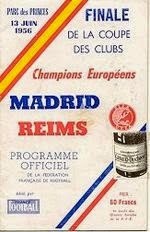 Reims made it back to the Finals only once, in 1959, where they again lost to Real Madrid. 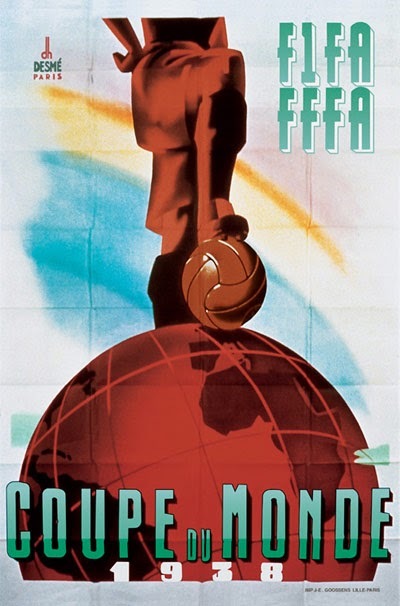 On 12 June 1938, Brazil and Czechoslovakia drew 1-1 in a World Cup match held at Bordeaux's Parc Lescure before a crowd of 19,000. Brazil took the lead with a goal in the 30th minute from Leônidas (who would go on to become the tournament's top scorer that year with 7 goals). The Czechs equalized in the 65th minute after being awarded a penalty that was converted by Oldřich Nejedlý (the previous tournament's top scorer with 5 goals). The teams played through thirty minutes of extra time, but ended in a 1-1 draw. Known as "the Battle of Bordeaux," the match was remarkably violent, with three players sent off for hard fouls - Machado and Zezé Procópio for Brazil and Jan Říha for Czechoslovakia. There were several injuries, with the Czechs faring the worst - Nejedlý suffered a broken right leg, Josef Košťálek was injured in the stomach, and captain František Plánička's right arm was broken. The Brazilians were not unscathed, as both Leônidas and José Perácio left the field with injuries. The teams replayed the match on 14 June, with both sides fielding several reserves. Leônidas was able to play, however, and scored in Brazil's 2-1 victory. 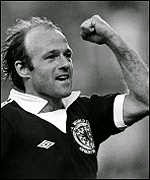 On 11 June 1978, Scotland midfielder Archie Gemmill scored against the Netherlands in the group stages of the World Cup. Playing in front of over 35,000 people at the Estadio Ciudad de Mendoza in Argentina, Scotland started the day tied with Iran at the bottom of the group with only one point each, while the Netherlands were tied at the top with Peru on 3 points. At the time, wins earned only two points, so in order to advance, the Scots needed to defeat the Dutch by 3 goals to pass them in the standings on goal differential. Scotland's chances took a turn for the worse when the Netherlands were awarded a penalty, which forward Rob Rensenbrink converted in the 34th minute. Scotland equalized in the 44th minute, however, with a goal from forward Kenny Dalglish. Gemmill then scored to put them ahead in the 46th minute. He wasn't finished, though. In the 68th minute, Gemmill shot a goal past the Dutch keeper to give the Scots a 3-1 lead. As described by The Scotsman in the paper's match report, "The little midfield player homed in on goal, played a magnificent one-two with Dalglish, then sprinted into the box and thumped a glorious goal past Jongbloed to revive all the hopes which had died the death this past fortnight. It was an extraordinary goal and an extraordinary moment. Suddenly Scotland were dreaming of glory again." The euphoria was short-lived, as Dutch winger Johnny Rep netted in the 71st minute and the match ended at 3-2, eliminating the Scots. Despite the result, Gemmill's goal is remembered to this day as one of the greatest goals ever scored in the World Cup.